Exciting news reaches the Moonbase from Rappy McRapperson of a new Christmas single by Wing! It’s entitled Santa Claus on a Helicopter and it’s available from iTunes.Wing also has a new Christmas album on the way called Carols, Rap and Sing: a Beautiful Christmas with Wing which you can order directly from the good lady herself.It would be remiss of us not to mention that this isn’t the first Christmas album by Wing. Oh no. 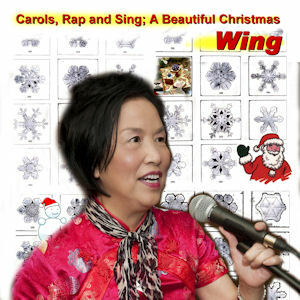 You can also get Everyone Sings Carols With Wing from iTunes or Amazon . This entry was posted in new release and tagged christmas, Rappy McRapperson, Wing. Bookmark the permalink.